It’s hard to believe that another awards season has come and gone. As always, the five days that encompassed the Edgar Allan Poe Awards in New York City and the Malice Domestic Convention in Bethesda, Maryland were jam-packed. It all began for us on Wednesday, April 27, when EQMM’s Robert L. Fish Award winner Russell W. Johnson and his wife Michelle stopped in at our offices on Wall Street to record a podcast of Russell’s winning story, “Chung Ling Soo’s Greatest Trick,” which you can listen to through a link on our website beginning June 1. The EQMM Readers Awards are given each year on the same day as the MWA’s Edgar Allan Poe Awards, at a Dell Magazines cocktail party preceding the Edgars banquet. The Dell party was at a new venue this year, the beautiful, historic library of the General Society of Mechanics and Tradesmen. Our guests included three of our 2015 Readers Award winners, all of whom we congratulate: Margaret Maron (1st place for “We on the Train”), Brendan DuBois (tied for 2nd place for “The Lake Tenant”), and Lou Manfredo (3rd place for “Rizzo’s Good Cop”). William Hallstead (who tied for 2nd place for “No Cabs After Midnight”) was unable to make the trip from Florida, but the longtime EQMM contributor’s many decades of contributions to our field (starting with his penning of the 31st book in the Hardy Boys series!) were remembered in his absence. In a surprise twist for your editors and the rest of the EQMM staff, EQMM itself received an award at this year’s cocktail party. We knew that EQMM’s book review columnist, Steve Steinbock, had accepted an award on the magazine’s behalf from the Baker Street Irregulars (the world’s oldest Sherlockian organization) at their annual banquet this past January. But as the honor was, at least in part, for the reviewing of books of Sherlockiana, we thought the award had found its proper home with Steve. When he crossed the country with it at the end of last month to present it for permanent housing at our offices we were truly touched. Our thanks go to both the BSI and Steve; the plaque will have pride of place in EQMM’s space. This year’s Edgar Allan Poe Awards banquet marked the 70th anniversary of the presentation of the awards in Poe’s name. It was not, however, the 70th year in which the coveted busts of Poe that we’re all so familiar with were given. That small treasure, designed by Peter Williams, didn’t appear until 1948, the third year of the awards. This year’s best short story Edgar went to Stephen King, for “Obits,” from Bazaar of Bad Dreams; we want to give a big shout out to him and also to Mat Coward, whose EQMM story “On Borrowed Time” was one of five stories (out of 600 or more submitted) to receive an Edgar nomination. No sooner were the Edgar Awards festivities over (for some in the wee hours of the morning) than it was time to get ready to board trains for Washington, D.C. to join the annual Malice Domestic Convention in Bethesda. One of the most welcoming and relaxed of all the events on the mystery calendar, Malice this year was a great way to conclude several days of reconnecting with friends in the mystery community. At the Agatha Awards banquet, EQMM’s latest Readers Award winner, Margaret Maron, took home the Agatha Award teapot for best novel for the last book in her very popular and long-running Judge Deborah Knott series, Long Upon the Land. Two other authors with strong ties to EQMM took home awards this season that I want to mention. One is the current president of the U.K.’s Detection Club, Martin Edwards. A writer who got his start in EQMM’s Department of First Stories, Martin has become not only a leading fiction writer but a noted scholar in our field. His book The Golden Age of Murder claimed both the Edgar and the Agatha in the best critical category. Taking home the Agatha Award for best first novel was EQMM’s frequent contributor Art Taylor. Art also got his start in our Department of First Stories, and his winning book, On the Road With Del and Louise, is actually a “novel in stories,” including a couple of stories that first saw publication in EQMM. At the Agatha Awards banquet I had the privilege of sitting at a table hosted by this year’s Lifetime Achievement Award winner Katherine Hall Page. 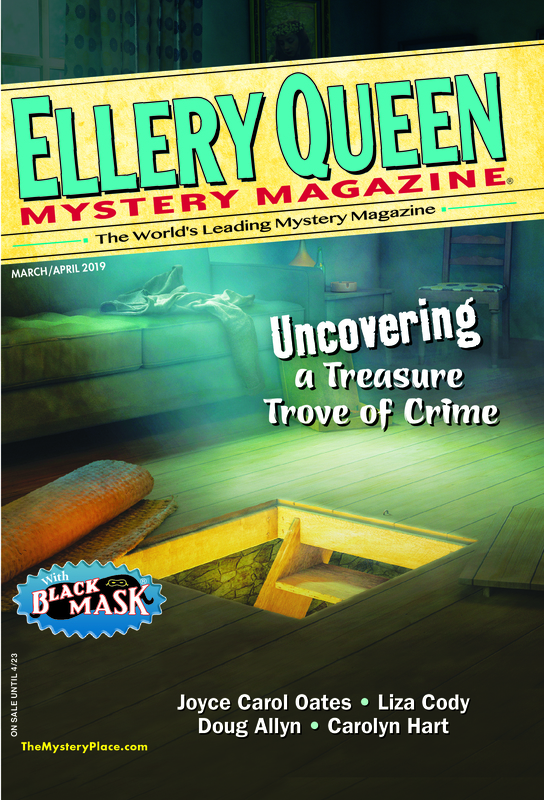 There I had the pleasure of catching up with Terrie Farley Moran, EQMM’s nominee for the Agatha Award, for her November 2015 story “A Killing at the Beausoleil.” The short-story Agatha went to Barb Goffman for her AHMM story “A Year Without Santa Claus?”—congratulations, Barb and AHMM!—but an enthusiastic hats off is also due to Terrie for a story that reflects the best in the classical tradition! Finally, the winner this year of the Malice Domestic Convention’s Amelia Award, for contributions to the field, was Douglas Greene, the founder and owner of Crippen & Landru Publishers, the genre’s most distinguished line of single-author short-story collections. Doug has been a stalwart friend of our magazine, and many of his collections have been drawn largely from EQMM. Doug’s wife Sandi, who worked side by side with him at Crippen & Landru for many years, was with him to enjoy the celebration of Doug’s achievements, which include his definitive biography of John Dickson Carr. This entry was posted in Awards, Ellery Queen, Genre, Writers and tagged awards, convention, edgars, editors, eqmm, malice, Malice Domestic, MWA, readers award, the edgars, writers. Bookmark the permalink. Enjoyed reading the recap here! Such a fun week of festivities—and I need to make it up to the pre-Edgars cocktail party another year for sure. I miss seeing everyone there. Thanks for including me here—and great seeing you in Bethesda, Janet! Congrats to you all! How wonderful that EQMM also won an award!